“Again, the terrifying cry rang out. The Doctor quickened his pace along the gloomy tunnels of the castle. Suddenly, from the darkness lumbered the mighty Aggedor, Royal Beast and Protector of the Kingdom of Peladon! The Doctor fumbled in his pocket. Would the device work? As he trained the spinning mirror on the eyes of Aggedor, the terrible claws came closer and closer…” What is the secret behind the killings on the planet of Peladon? Is Aggedor seeking revenge because the King of Peladon wants his kingdom to become a member of the Galactic Federation? Will the Doctor escape the claws of Aggedor and discover the truth…? 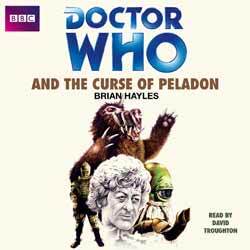 The Curse of Peladon is one of my favourite Jon Pertwee stories, and Brian Hayles’s novelisation of his own script for that serial is one of my favourite Third Doctor books. In both cases, the unusually diverse array of alien life forms – including the hermaphrodite hexapod Alpha Centauri, the half-automaton Arcturus, two Ice Warriors and the legendary beast Aggedor – are a large part of the appeal. I remember borrowing the 1980 hardback edition from my school library, and being mystified that its colourful Bill Donohoe cover never appeared on my subsequent paperback collection. It doesn’t appear on the inlay of this five-CD set either, though the 1992 Alister Pearson paperwork artwork does, as do all six of Alan Willow’s interior illustrations. The participation of the Ice Warriors is particularly interesting, as the writer elevates them above the status of mere monsters, as they had been in two previous Patrick Troughton serials, into one of the show’s earliest examples of a fully rounded alien civilisation. In terms of book publishing, though, this was the first time the martial Martians had appeared in print (in 1975), and the first Who novelisation to be penned by Hayles (it was followed by Doctor Who and the Ice Warriors a year later). The author doesn’t make any drastic changes to his original plotline, but then he doesn’t really need to. The story was strong back in 1972 and it’s still strong today. The character development of the timid Alpha Centauri, who in the book changes colour with his/her moods, is well documented, but Hayles also explores the thoughts and feelings of all the other participants, including the mute Grun. The European Union allegory, with the Federation standing for the EU and Peladon representing the UK, may be a little unsubtle and a tad dated by now, but it still carries some resonance – not so much in the Peladonians’ fear of change or of mineralogical exploitation, but rather their concerns about a loss of sovereignty and the undermining of local laws. A previous audio version of this book, read by Jon Pertwee, was released in 1995. That was an abridged edition, running to 90 minutes. This release is unabridged, with a running time in excess of five hours. The reader this time is David Troughton, who played King Peladon in the original serial and is of course the son of Patrick Troughton, Pertwee’s predecessor in the role of the Doctor. His vocal qualities are quite different nowadays from the higher-pitched timbre of his youth, but he is still an excellent choice of reader. At times his gravelly tones are more similar to Pertwee’s than his own father’s, which is fitting for this story. I wish I could say more about his performance, but I often forgot that I was being read to and just became absorbed in the story, which is no bad thing. The reader’s voice is suitably treated by sound designer Simon Power when portraying all the alien delegates. All in all, this right royal beast of a yarn works just as well on audio as it did on the printed page and on the small screen.